(74-201): SMS Coverall, Elastic Wrist and Ankles, Breathable. Each for $65.00. 2X-5X Each for $68.25. 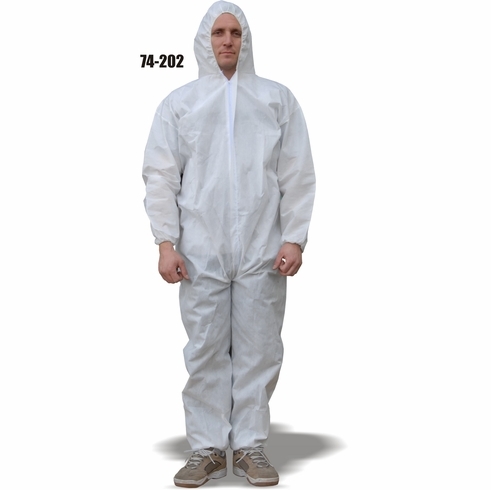 (74-202): SMS Coverall, Elastic Wrist and Ankles, Attached Hood, Breathable. Each for $68.75. 2X-5X Each for $72.19. (74-203): SMS Coverall, Elastic Wrist and Ankles, Attached Hood and Boot, Breathable. Each for $74.58. 2X-5X Each for $78.31. AeroTEX SMS Coverall This coverall is made of SMS barrier material, a tri-laminate construction that offers a high tensile strength and toughness that is soft, drapable and easy to work in. The inner layer of polypropylene provides an excellent barrier against dusts, fibers, liquid splashes and sprays. Coveralls are ideal for maintenance, manufacturing, food processing, agriculture and much more. AeroTEX barrier provides superior particle holdout and excellent breathability. All suits meet ANSI/ISEA 101-1996(R2008) for sizing.